Comment: A razor-sharp Wieland cut plus the checkerboard make for a dazzling light play. Some colorless inclusions are visible only under the lens but they make a fascinating detail to study. 14mm square, a truly big gem not for a ring under size 8, but better still for an impressive pendant. 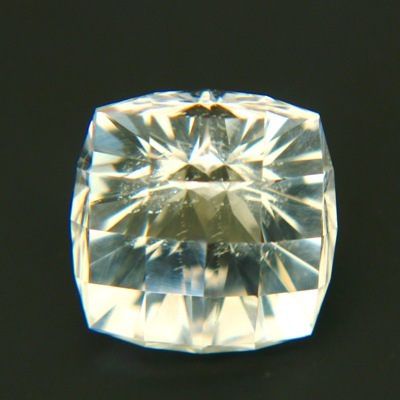 Danburite is a relatively new gemstone with good brilliancy and durability. If you currently don't want to shell out $4m for a 15+ carat diamond this is a good alternative. Always better than any images. See it, is to love it. 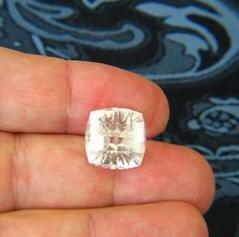 Danburite has gotten much traction in recent years. Such big clean precision cut pieces are rare. Under 'more images', note the magic reflections splintering color and light. Master Wieland's phantastic cutting adds a world of magic to a giant gem.